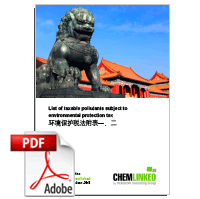 China’s Law of Environmental Protection Tax was drafted in 2015 and passed by the Standing Committee of The National People’s Congress of China in late 2016. The Law took effect on Jan 1st 2018 and ultimately replaced the emission fee system which has been in place for almost 40 years. Two appendices are attached with the Law, stipulating the scope, pollution equivalents and taxation standards applicable to various pollutants, including atmospheric pollutants, water pollutants, solid wastes and noises.